David Mamet films (House of Games, The Spanish Prisoner) take place in wayward places where con artists and schemers flourish by surviving on the nearest sucker. Deals take place on the outskirts, in seedy clubs, cheap hotel rooms, and alleyways. Regardless of his picture’s genre or theme, each employs The Con, making use of twists and turns until The Big Reveal. His films are like a striptease with layer after layer dropping to the floor until in the end we have The Naked Truth. Innocent lines of dialogue and inconsequential actions undoubtedly have bearing on the climactic finish, where all parties involved in the preceding con either get away with their crimes or find themselves impossibly pinned down. Redbelt is about Mixed Martial Arts, the commerciality of fighting competitions, and the singularity of samurai honor. We follow jiu-jitsu instructor Mike Terry (Chiwetel Ejiofor) who struggles to maintain his principles of purity, though his world seems to collapse because of those principles. Refusing to contend professionally because competition weakens the fighter, Terry upholds that “There’s always an escape.” Sondra (Alice Braga), his wife, can’t see an escape from their bills; she continually rides him about his financial troubles. Which are his financial troubles, not hers. Money seems Sondra’s primary concern in all conversations, to unsympathetic extremes. Forget the right thing to do… How will Terry’s honorable and purity-driven decisions affect The Business? Through a series of events too complicated to describe here, Terry finds himself against the wall, potentially forced to break his code’s dismissal of sport fighting to pacify his money situation. With this setup we might expect something in the realm of Bloodsport or The Karate Kid or Rocky situated within a contemporary MMA backdrop. But the writer-director’s clear influences for his film include The Set-Up, Bad Day at Black Rock, possibly Masaki Kobayashi’s Samurai Rebellion, and unquestionably Akira Kurosawa pictures—movies about principle, not violence. Principle guides the film; The Con and a burst of violence end it (with an arguable terseness—which will be my only complaint in this review). Mamet is a confessed lover of Brazilian jiu-jitsu and MMA competitions. Fighters Randy Couture, Ray Mancini, Enson Inoue, and Jean Jacques Machado all make guest appearances (just look for the chaps with cauliflower ears). Despite his respect for the sport, he addresses the paradoxical nature of competitive fights versus obedience to The Way of the Samurai (Bushido). Ancient Japanese ideals mean nothing more than a marketing gimmick to slimy pay-per-view producers. A modern samurai warrior cannot exist serenely in a world where fighting makes you money; The System will inevitably scar purity. Populating this tale is Mamet’s usual band of loansharks and smooth talkers, acted to perfection by his recurrent troupe of bravado performers like Ricky Jay, Joe Mantegna, Rebecca Pigeon, and David Paymer. New blood consists of Tim Allen’s offbeat casting as a sour movie star rescued by Terry in a bar fight, Rodrigo Santoro as Sondra’s wealthy club owner brother, and Emily Mortimer (from Lars and the Real Girl) as a pill-popping lawyer in need of Terry’s discipline. Each has ulterior motives or imposing character turns; no one is what they seem. As usual, actors find their work easy thanks to Mamet’s expertly written dialogue, which contrary to traditional film theory takes precedence over visuality in his films. 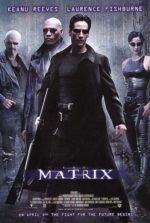 Where normal martial arts-themed films would allow fight scenes to do the talking, Mamet places the action in dialogue, creating, in the end, order from what appears to be an initial disorder. Ejiofor excels beautifully in these terms, offering perhaps the best performance ever given in a Mamet film. A Pulitzer Prize-winning playwright, Mamet often turns his actors into merely vessels for his works; they speak in half sentences and unfinished thoughts—his signature staccato “Mametspeak”. But Ejiofor transcends those—what some, not myself, would call—limitations, carrying nuances in his expressive eyes, pained concern in his upturned eyebrows, and methodical control in his physicality. He’s been limited to supporting roles in great releases and independent gems like Children of Men, Dirty Pretty Things, and Serenity, but with any luck Mamet’s film will elevate him to standard leading man. Back in 2000, Mamet made State and Main, a behind-the-scenes comedy about a Hollywood film production that threatens to warp a small town with their presence. 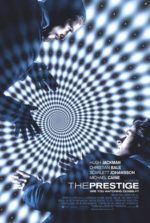 The production’s screenwriter (Philip Seymour Hoffman) finds he must sell himself to get the movie made; though he’s protected from having to surrender in the finale, he nevertheless belongs to a crooked system. Mamet supposes, in a rare moment of optimism, that two can happily coexist. 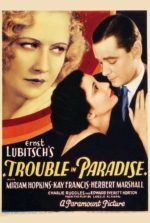 This theme courses through the director’s output, suggesting that to remain pure one must sell a piece of themselves, or at the very least face their attempted corruptor. 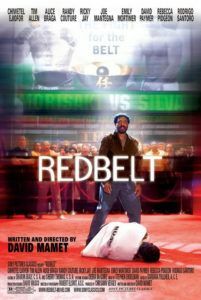 Redbelt uses such heroic idealisms as its basis for a noirish endeavor into samurai philosophy, shot skillfully in a likewise genre-bending way by cinematographer Robert Elswit (the Oscar winner for There Will Be Blood). Mamet explores his own unfamiliar genre territory, which usually isn’t worth more than a few entertaining blows to the head, by elevating the material, leading to a profound (albeit brief) solution, several great performances, and, of course, matchless writing.